1. 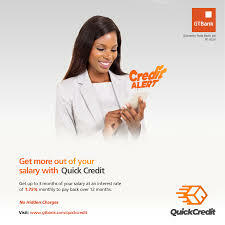 Customers are qualified based on the consistent payment of their salaries in the last six months. 2. Applicants must have received salaries in their GTBank accounts in the last two months through the current employer and present BVN. 3. Net salary of the applicant must not be less than N10,000. 4. Age qualification for the loan is 18years to 59 years. 5 .Applicants phone number must be the same as registered with the bank. 6. Repayment of loan won't exceed 33.33% of applicants net monthly salary. 7. Customer musnt have a serious report of a pending loan yet to be paid in any organisation. Applicants can apply by dialing *737*51*51# via the registered line with the bank. The loan amount is between (N10,000- N5 million) but please do note that for you to get a bit much amount of money has to do with consistent payment of salary overtime as well as how much a customer earns. What Is the Charge Rate? Rate is charged per annum as a customer is allowed to pay back the money annually.